Will the Lublin Free Walking Tours take place when bad weather conditions occur? Yes, Martin’s City Tours will provide you a great tour regardless of the weather conditions. We are able to tell some stories indoors, so you are less exposed to the elements. The guide will make the decision after consulting the group. Is there a minimum number of participants for the Free Walking Tours? No, the tours will be held regardless of the number of visitors. Where do The Original Lublin Free Walking Tour finish? At Gourmet Grocery Store called Własnej Roboty. It is located in a side street of Lithuanian Square (Plac Litewski). They have a unique assortment of regional, home made grocery products – quality Polish food. On weekdays, they also sell delicious sandwiches, soups, coffees, etc. Do I need to pay ticket fees during the Free Walking Tours? No, all locations we enter during the tours are free of charge. 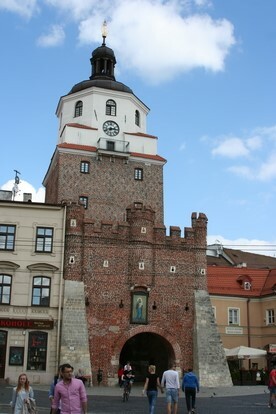 Most parts of the routes are easily accessible by wheelchair, nonetheless Lublin is a historical town so some improvisation from the guide and the guest is required. Please, be so kind to inform us in advance, so we can come up with suggestions and solutions. Why do you ask groups bigger than 7 people to book a group tour? Martin’s City Tours aim is to provide comfortable and enjoyable Lublin Free Walking Tours for all our visitors. An organized group can make the regular free walking tour group too big, which is not convenient for all of us. Do you offer other tours than the tours mentioned on the site? Yes, Martin’s City Tours can offer you an entirely personalized tour. Please, contact us and we will discuss the possibilities. Why do you ask me for my phone number and email address? We like to be able to inform you in advance when a tour needs to be cancelled. We try to execute all our scheduled tours, however, occasions can occur that we are not able to do so. Moreover, a nice group picture is taken at the beginning of every tour. We will mail you this picture after the tour. The guide will be waiting for you inside Pub u Szewca (Grodzka 18 in the Old Town). They will be wearing a big badge on a red lanyard with their name and our logo on it. You can also meet our guides here. How to get to the meeting point from my ho(s)tel? Please, ask for assistance at your reception desk or send us an email at: info@martinscitytours.com. Are the prices specified on the website including or excluding VAT? Martin’s City Tours will provide a VAT invoice on request. In case an invoice is required, the VAT will be added to the fees specified on the website. Otherwise, the rates specified are including VAT. Can I take a video recording of the tour? All the catching, unusual stories we share with you during our tours are a result of painstaking research and protected by copyright. Thus, no form of video or audio recording is allowed. We appreciate your understanding. Does Martin’s City Tours belong to a chain? No, we have deliberately refused some offers to collaborate with walking tour organisations. Quantity doesn’t usually mean quality. Being an independent Free Walking Tours company, we do not need to follow any standard patterns for free walking tours. As a result, you can be sure you will not only learn a lot of easy-to-remember facts about Lublin but you will also get a unique Lublin experience, not available elsewhere. Our aim is to make sure our charming city will stay in your memories for a very long time.